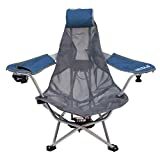 The Kelsyus Mesh Backpack Chair is great for the beach, camping trips, tailgating, watching sporting events from the sidelines, or just hanging out in the backyard. The chair sits close to the ground, making is great for stargazing or watching a fireworks show, and its low-slug position helps you keep in line with the breeze when relaxing at the beach or lake. The sturdy but breathable mesh fabric encourages air circulation to keep you cool, and with the built-in cup holder and fully adjustable headrest, you won’t want to get up from your seat all summer long. One of the chair’s most unique factors is also one of its most convenient: The patented extra-wide armrests convert into backpack straps, so there’s no bag to keep track of and you’ll be able to bring it along with both hands free! The Kelsyus Mesh Backpack Chair comes in an attractive, neutral gray and blue and can support adults weighing up to 250 lbs.